Rafael Nadal romped to a straight-sets victory against Alex de Minaur as he reached the last 16 of a Grand Slam for the 43rd time in his career. The 17-time Grand Slam champion sent out a statement by dragging the 19-year-old Australian hope over every inch of Rod Laver Arena on his way to a 6-1 6-2 6-4 victory on Friday. De Minaur won the warm-up tournament in Sydney and had been touted as the home country's best hope for success in the men's draw, but the scoreline was exactly the same as in their meeting at Wimbledon last summer. "I think that I played a very solid match, happy for that," said Nadal. "I want to congratulate Alex for a great start to the season, I think that he has an amazing future." Action from the Australian Open third round with Roger Federer, Rafael Nadal, Maria Sharapova and Caroline Wozniacki in action. 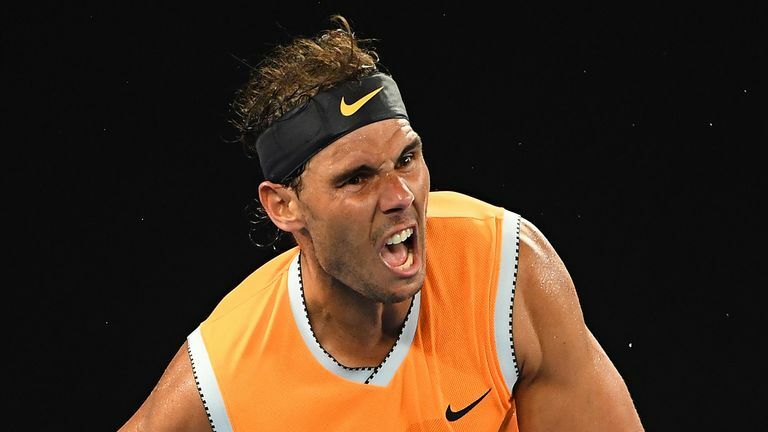 The Aussie showed great fighting spirit to make a game of it in the third set and saved five match points, yet Nadal was simply too strong and moved through to an intriguing clash with unseeded Czech former world No 4 Tomas Berdych for a place in the quarter-finals. On facing Berdych, Nadal added: "When you are coming back from a tough period of injuries, when you're playing well, the energy is even higher. "I predict a very, very difficult match. I need to be at my best, I think I am on the right way. I need to keep it going." Grigor Dimitrov's rejuvenation under the wing of Andre Agassi continued apace as he powered into the last 16 with a straight-sets win over Italian Thomas Fabbiano. The 27-year-old Bulgarian won 7-6 (7-5) 6-4 6-4 in just over two hours under the roof at Melbourne Arena to stay on course for a potential quarter-final against Nadal. Dimitrov, the world No 21, singled out his coach and tennis legend Andre Agassi for the highest praise, saying: "Just him sitting out there, watching my match, just giving me his time is the most valuable thing on earth to me." Before that can happen, the 20th seed's resurgence will need to continue against the unseeded American Frances Tiafoe. Tiafoe came back from the brink to knock out veteran Italian Andreas Seppi 6-7 (3-7) 6-3 4-6 6-4 6-3 in three hours and 17 minutes.